A leading Asian intellectual says the world is transforming in ways not fully understood by the West, Andrew Moody reports. Kishore Mahbubani believes the West is in denial about how the world is changing around it. The 70-year-old, who is one of Asia's leading public intellectuals, says it has yet to adjust to the emergence of China as the world's second-largest economy and the rise of other countries such as India. "Three of the top four economies in the world are now Asian. The West therefore ought to understand that this is not a world it can dominate anymore," he says. "It needs to ask itself the question as to what practical and pragmatic changes it needs to make to get used to this world, but it is not doing that." Mahbubani, who was in Beijing for a speaking event, has just published a new book, Has the West Lost It? A Provocation. The Singaporean academic and former diplomat insists, however, that he is not on a mission to belittle the West's contribution to civilization and the advancement of humankind. "We are living in a time where this great Western project to improve the human condition has succeeded. The West should be celebrating and saying, 'Hooray! We did it!' but it is instead clearly depressed." This sense of gloom is purveyed by CNN and other Western media outlets, according to Mahbubani, when they focus on such issues as the economic hardship of the US Rust Belt or Brexit when most of the world is experiencing an unprecedented rise in living standards. "You would think that this was a depressing period in history, but most people in the West are shocked to discover that the last 30 years have been the best for human history since history began. In 1950-two years after I was born-75 percent of the world's population, including me, were living in extreme poverty." Mahbubani says it is impossible to ignore the contribution of Deng Xiaoping's reform and opening-up initiative, which has delivered 800 million out of poverty and whose 40th anniversary was marked last year. "Deng Xiaoping will go down as the greatest leader of the 20th century, even greater than Churchill or anybody, because he picked his country up at a painful and even tormented time after the 'cultural revolution' (1966-76) and turned it around. He carries out the largest and most revolutionary transformation of China and opens it up to the world," he says. 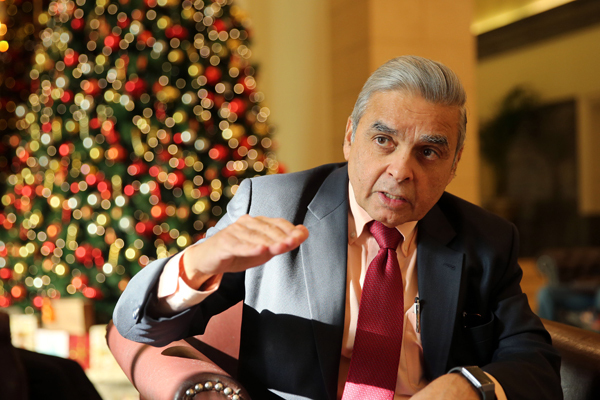 Mahbubani, who was speaking in the lobby of the Nuo Hotel in central Beijing after addressing the Third Understanding China Conference, co-hosted by the Berggruen Institute's 21st Century Council from Dec 16 to 18, says the takeoff of China and other Asian countries was at a time when the West was experiencing a moment of "absolute hubris". This, according to Mahbubani, was when the Soviet Union collapsed in 1990 and Francis Fukuyama, the US political scientist, wrote The End of History and the Last Man, arguing that Western liberal democracy had prevailed for all time. "The assumption was that the West could keep going on autopilot, but it was precisely the wrong time for it to turn on that mechanism because it was when Asia began waking up in a serious way," he says. "It was a time for the West to do a strategic U-turn and give up on the idea that it can keep dominating the world and intervening in so many conflicts, but it did the opposite. Francis is a wonderful person, but his book did a lot of brain damage to the West."